Home / Technical Articles / Does transformer hum make you nervous? It does me. Noise is caused by magnetostricition (changes in shape) of the core laminations while the transformer is energized. Transformers emit a low-frequency, tonal noise that people living in their vicinity experience as an irritating “hum” and can hear even against a noisy background. The electrical power industry produces a range of solutions to abate humming, which originates in the transformer’s core and, when it is loaded, in the coil windings. Core noise is generated by the magnetostriction of the core’s laminations when a magnetic field passes through them. It is also known as “no-load noise”, as it is independent of the load passing through the transformer. As the phenomenon occurs it causes air columns to be formed in the spaces between the transformer core and the low-voltage windings of the core and other adjacent parts of the transformer, and these air columns cause audible noise as it moves between the various parts of the transformer. Magnetostriction takes place at twice the frequency of the supply load: for a 60 Hz supply frequency, a lamination vibrates at 120 cycles per second, and the higher the density of the magnetic flux, the higher the frequency of the even number harmonics. Also, the audible sound produced by fan-assist cooled (FAC) transformers is partially due to the energizing of the core by the alternating voltage applied to the windings and also by the fans forcing air through the coils. The noise generated by the core, and whose fundamental frequency is twice the frequency of the applied voltage, will create audible sound that will be present even under no load conditions. The vibrations producing audible sound can occur in the core, coil, mounting, housing, and in the conduit. The transmission of sound from the transformer can be by various media such as air, metal, concrete, wood or any combination. Amplification of audible sound can occur in a given area due to the presence of reflecting surfaces. Transformer hum also arises through the vibration caused when the load current passes through the windings, interacting with the leakage flux it generates. This “load noise” level is determined by the size of the load current. Acoustical-absorbing material should be mounted on reflecting surfaces to reduce sound reflection and possible amplification. 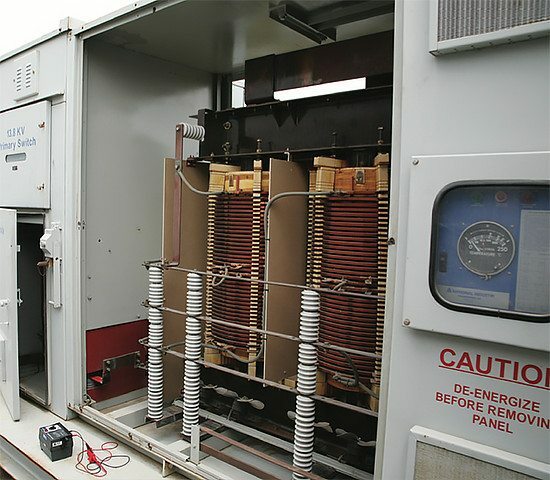 Transformers should be mounted on a firm support having as great a mass as possible. 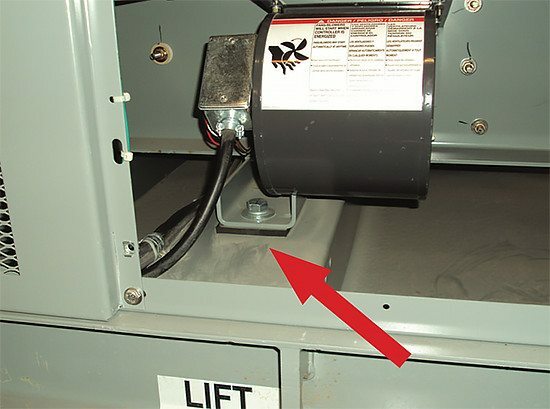 Vibration pads or properly designed isolation mounts under the transformer will reduce transmittal of sound. The neoprene rubber isolation pads (Figure 2) provided with the unit should be installed between the transformer and its mounting surface. is will reduce case vibration and compensate for slight unevenness of the mount. Care must be taken to ensure proper and tight installation of conduit. Flexible conduit is recommended. A normal conversation is typically 60-70 dB. OSHA has an actionable level to sound exposure at 85 decibels whenever noise levels equal or exceed 8 hour time weighted average sound of 85 decibels, or a dose of fifty percent (29 CFR 1910.95(c)(1). Per General Electric Installation Guide No. 475A667AAP008, dry type transformers are designed and manufactured to comply with NEMA and ANSI standards. e decibel values referenced below (Figure 2) represent average values obtained in a sound laboratory per industry standard test procedures. Noise is defined by Merriam-Webster as “any sound that is undesired or interferes with one’s hearing of something”. So who is to say what sound is undesired or interferes with something? What may be a calming sound of transformer (humming to some), may be a nuisance to others. Just as rock concerts may be annoying to some, and the loud music and rhythm may be stimulating and desirable to others. And since different people have different opinions as to what is acceptable and what is not, and how annoying a transformer has become is different in different situations, the best tactic is to try and mitigate the problem on the front end through proper placement and design. When initially tested and commissioned make sure you carefully inspect the shipping bolts, packing materials, and resilient mounts so sound is kept at a minimum. 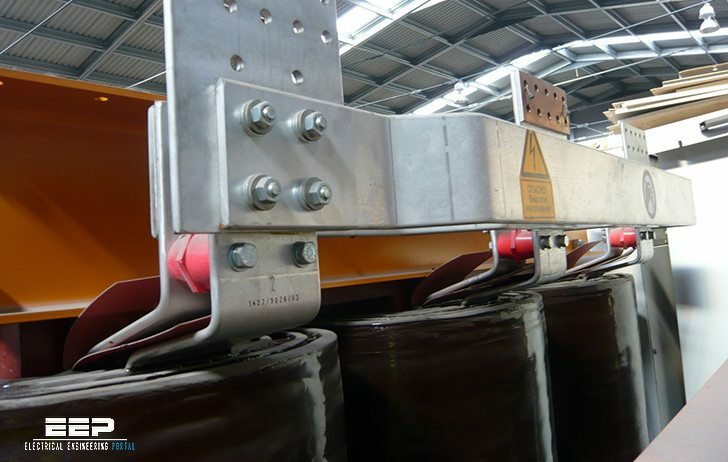 Removal or loosening of the shipping bolts will allow for a smooth transfer of vibration and should reduce the overall noise generated by the unit. I have a feeling that this article will become a very important one to me, given my dream home’s odd electrical system: 480v trunks leading to each room being stepped down and split into multiple 120v branches. The reason for this is the high load I can put on a room. As it stands right now, I may have to rewire my bedroom to get enough capacity to run the equipment I am going to put in it. Oh, and for the record, Transformer hum does not make me nervous. i quite like it actually (though, as you pointed out, others may not).